Top ten list of reasons why the exodus route was not discovered until now. Population of the Exodus Jews: 2.5 Million Hebrews left Egypt! Excluding various exodus routes: Bitter lakes, Gulf of Suez, Mt. Musa, Ein el-Qudeirat, Mt. Karkom, Lake Sirbonis, Lake Ballah, Nuweiba Beach. Israel departs from Sinai for promised land after spending 11 months, 5 days at Sinai. They navigated about 20 stops over a period of between 10.5 and 11 months between Sinai and Kadesh Barnea. They celebrated their second Passover at Sinai, then leave almost immediately afterwards for Kadesh. They arrived at Kadesh about 11 months later and immediately celebrated their third Passover. Therefore their arrival at Kadesh was the end of the second year and was marked by their third Passover. They spend 38 continuous years at Kadesh Barnea (they do not leave and come back), then depart for the Jordan in the 40th year. Many take the wrong view that Israel came to Kadesh, in the third year, left, then wandered around for 38 years, then returned again to Kadesh (or a second different Kadesh). Click here for detailed discussion proving Israel arrived at Kadesh in the third year and STAYED at Kadesh for 38 more years until they left for Canaan. Num 11: Quail given, 70 elders are given the Holy Spirit. So the name of that place was called Kibroth-hattaavah, because there they buried the people who had been greedy. " Exodus 10:10 + 19, shows two different and opposite directions of wind. The Hebrew word for "west" is the same word as "Sea". So "west wind" is literally a "sea wind". There is a distinct word for "east" and is the direction of the rising sun. The tabernacle in the wilderness was oriented facing towards the east. The question is does the Numbers 11 passage mean "brought quail from the west [sea wind] or from the sea [body of water]. Quail are upland game birds that do not live near salt water. If it said that God brought pelicans from the sea, it would make more sense. Therefore it is unclear if the text of Numbers 11 means "brought quail from the west or from the sea". Since the Ps 78:9 passage says the quail came from both south and east winds. Perhaps God blew them in from a variety of winds: east, west, south at different times. Or perhaps it is saying that God brought them in from near the sea (or direction of the sea) with both east and southerly winds. In any case, it is not very helpful in making a determination as to where the camp was located in relation to the Red Sea. "remained at Hazeroth" indicates a longer period of time. Miriam and Aaron challenge Moses over his Cushite wife (Zipporah) They also said, "Has the Lord indeed spoken only through Moses? Has He not spoken through us as well?" God called them to the tent of meeting and Miriam turned leperous. Moses prays and God tells Miriam to be confined outside the camp for 7 days, since she was unclean. The account of their travel from Num 10:11-12 down to Numbers 12:16 follows the Numbers 33 list. However starting in Num 13, we skip about 18 stops and go directly to Kadesh in the narration. This kind of narration style thing is typical in both the Old and New Testament. In fact the statement that "the sons of Israel set out on their journeys from the wilderness of Sinai. Then the cloud settled down in the wilderness of Paran." (Numbers 10:12) is a summary verse of a larger pattern of travel to Kadesh. When it says, the cloud settled down in Paran, that means at Kadesh. The section that follows discusses a few important things that happened before Kadesh (grumbling for meat at Taberah/Kibroth-hattaavah [ch 11]; Miriam's and Aaron's challenge to Moses Egyptian wife at Hazeroth [ch 12]) and events that happened at Kadesh: spying out the land; The man caught gathering sticks on the Sabbath; Koran's rebellion, death of Miriam, Moses striking the rock, Moses requests the kings of Edom and Moab for passage to get to the Jordan.) As we can see, these events spanned 38 years. They came to Kadesh once, then they left for the Jordan. The key is to view the entire section between Numbers 12:16 - 20:1 as an overview of the major events of the entire 38 years at Kadesh. It begins in 12:16 where they jump from Hazeroth forward 18 stops to Kadesh. This overview ends at 20:1, where it recounts they came to Kadesh in the first month after leaving Sinai (11 months later). Some misuse Numbers 20:1 as evidence that Israel came to Kadesh, but then left to wandered somewhere else for 38 years, then returned in year forty: "In the first month all the people of Israel arrived at the Desert of Zin, and they stayed at Kadesh. There Miriam died and was buried." Many commentators mistakenly believe this was the 40th year, but they are wrong. The verse tells us they arrived at Kadesh in the first month, but does not tell us the year! It does not say, "the first month in the 40th year". Since Israel left Sinai in the second month of the second year after leaving Egypt (14 months), this means they arrived at Kadesh in the first month of the third year after leaving Egypt or 24 months. 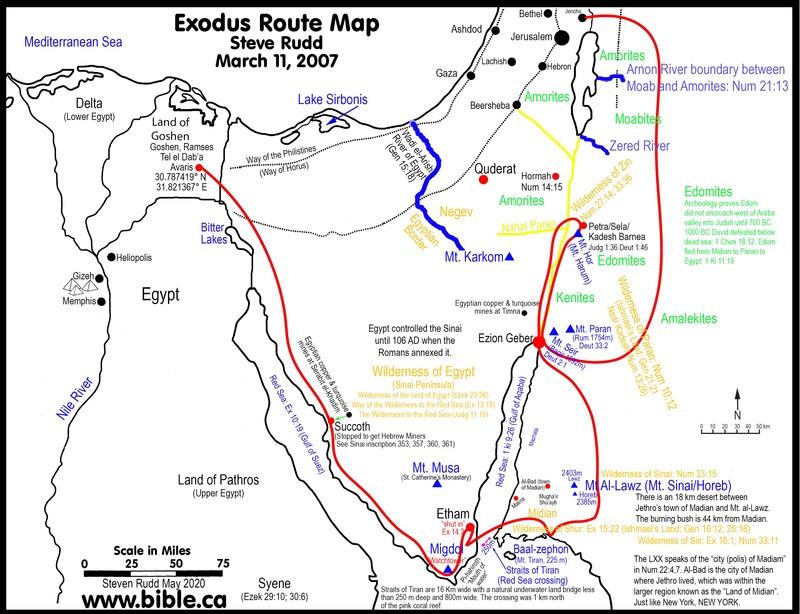 See Exodus route calendar for more details and below in a fuller discussion. Aaron did not die at Moserah, but that was where God told Aaron that he was going to die in the wilderness for his sin, just as Moses was later told at Kadesh when he struck the rock. The puzzle is not that the towns (Beeroth Bene-jaakan and Moserah) are similar to the list in Num 33. (Moseroth and camped at Bene-jaakan). They are different names. Moserah is different from Moseroth. "Bene-jaakan" means "the wells of the sons of Jaakan". Perhaps the Jaakan were a tribe or clan who dug wells for others for hire. "Beeroth Bene-jaakan" could easily be another set of wells dug or controlled by the Jaakans. They could have been outsiders or perhaps they were fellow Hebrews who were known as the "well diggers." Whatever the actual connection is, the names are not identical. The puzzle is not that these two names, (assuming they are the same as the Numbers 33 list) are in reverse order to the Num 33 list. The real puzzle is what does this listing of 5 stops have to do with the context at all and why does it say that Aaron died at Moserah, when we know he died at Mt. Hor. The solution is not to ignore the text as an uninspired addition to scripture. Psuedopigrapha is more clever than to contract known revelation on two counts (stop order and where Aaron died) and invent three new stops not previously recorded in the Numbers 33 list. In addition the narrative changes from first person to third. Perpetrators of such satanic crimes try to pass off their inserts so nobody notices. If you are tying to add something without getting caught, this is how not to do it. So it is valid inspired scripture. The other possibility is that it was a parenthetical thought added by the author of the book. Obviously Moses did not write the account of his own death at the end. Since the words of Deuteronomy 10 were spoken by Moses only a few months after the death of Aaron at Mt. Hor, it would be highly unlikely Moses would contradict such an important and recent historical event. 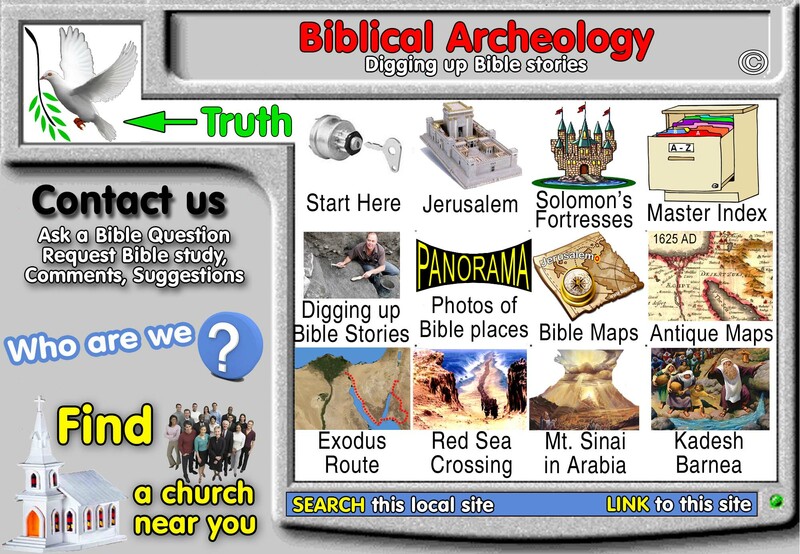 The insertion of this mystery itinerary of stops found nowhere else in scripture that is somehow connected with the death of Aaron is the real puzzle. What does it mean and why is it here at all? First we notice that the list of five stops begins and ends with places abundant with water. They always grumbled for water. Water was a sign of blessing from God. Second, this listing of stops must have been well known to the Hebrews who were standing there listening to Moses at the Zered Wadi. It is interesting that while Aaron was actively involved in the making of the golden calf, the Levites were absent. However in the punishment of the people for making the golden calf, Moses called for "anyone who is with him" and the Levites came forward. It seems the Levite were not in agreement with Aaron, their high priest and patriarch of the tribe. In the same way the high priest at the time of Jesus mislead his people into crucifying him. (Matthew 26:57). It is interesting that the only Levite mentioned in the new testament was "Barnabas, which translated means Son of Encouragement" (Acts 4:36). Just as the Levite were a positive force for good with Moses, so too Barnabas, the Levite was for the early Christians. Solution: After they left Sinai, we know they traveled for about 11 months. During this time, they went through these 5 stops. Aaron did not die at Moserah, but that was where God told Aaron that he was going to die in the wilderness for his sin, just as Moses was later told at Kadesh when he struck the rock. Both before and after this proclamation, God had given them the blessings of his grace with abundant water. Moserah was the stop between Sinai and Kadesh where God informed Aaron he was going to die and be replaced by his son some 40 years later and not enter the promised land. This ties into the larger context of the passage where Moses is recounting the sins of the people in connection with the golden calf. Verse 1 begins with God restoring fellowship with Israel by replacing the two tablets of the ten commandments that Moses had broken when Aaron had made the golden calf. This conclusion is reinforced by the fact that nowhere else in scripture records where Aaron was told, like Moses was told, that he would not enter the promised land for his grave sin of the golden calf. The Holy Spirit may have chosen to write the account in this way to separate the true Bible believers in His inspiration with those who always try to find ways to trash His message as full of errors, omissions and additions. We believe the Bible is the inspired word of God. This mountain must be in Edomite territory as they traveled from the far east, directly to Ezion Geber. 22. wilderness of Zin, that is, Kadesh. 38 continuous years at Kadesh. For a detailed discussion on all the events that took place during the 38 years while Israel was continuously camped at Kadesh, click here. The evidence is conclusive that the "majority view" is wrong and that Israel spent 38 continuous years at Kadesh Barnea. Did Israel arrive at Kadesh in the 3rd year and leave in the 40th? Or Did Israel arrive at Kadesh Barnea in the 3rd year, leave, then visit it a second time 38 years later? Moses struck the rock after first arriving at Kadesh in the third year. 1. The easiest way to prove that Israel spent 38 continuous years at Kadesh is the itinerary list in Num 33.
a. Here we have a detailed sequential list of all the stations from Egypt to Canaan. b. For those who believe they came to Kadesh then left shortly after the bad report came back from the spies, they are left with a huge hole in this list. c. If they left Kadesh, why does Num 33 not list a single location? d. This huge gap in the chronological information is devastating to those who take the "two Kadesh visits" view. a. Two visits to the same Kadesh: Some believe they came, left, wandered ? for 38 years and returned to the SAME location called Kadesh. b. Two visits to two different Kadeshes: Others believe they left on location called Kadesh, then left, wandering for 38 years then visiting a different geographic location called "Kadesh". c. Of course, both of these are wrong. The Bible clearly says they arrived at Kadesh and did not leave for 38 years. a. No indication of where they travelled after leaving Kadesh in the 3rd year but before they returned in the 40th year. b. The bible nowhere says they visited Kadesh twice. c. The Bible on says they left Kadesh once. d. While God commanded them to leave Kadesh in the third year (Num 20:1) they disobeyed and refused to leave and retrace their steps back towards Egypt the way they came via the Arabah valley towards Elat and Ezion Geber. 1. See the itinerary list above at Hazeroth and study it! 2. The biggest mistake is to fail to realize that many of the stories in the first five books of Moses do not follow a strickly chronological order. The Same is true of the New Testament gospels. 3. The account of their travel from Num 10:11-12 down to Numbers 12:16 follows the Numbers 33 list. However starting in Num 13, we skip about 18 stops and go directly to Kadesh in the narration. This kind of narration style thing is typical in both the Old and New Testament. In fact the statement that "the sons of Israel set out on their journeys from the wilderness of Sinai. Then the cloud settled down in the wilderness of Paran." (Numbers 10:12) is a summary verse of a larger pattern of travel to Kadesh. 4. When it says, the cloud settled down in Paran, that means at Kadesh. The section that follows discusses a few important things that happened before Kadesh (grumbling for meat at Taberah/Kibroth-hattaavah [ch 11]; Miriam's and Aaron's challenge to Moses Egyptian wife at Hazeroth [ch 12]) and events that happened at Kadesh: spying out the land; The man caught gathering sticks on the Sabbath; Koran's rebellion, death of Miriam, Moses striking the rock, Moses requests the kings of Edom and Moab for passage to get to the Jordan.) As we can see, these events spanned 38 years. They came to Kadesh once, then they left for the Jordan river which they crossed in 1406 BC. 5. The key is to view the entire section between Num 12:16 - 20:1 as an overview of the major events of the entire 38 years at Kadesh. It begins in 12:16 where they jump from Hazeroth forward 18 stops to Kadesh. This overview ends at 20:1, where it recounts they came to Kadesh in the first month after leaving Sinai (11 months later). 6. Some misuse Numbers 20:1 as evidence that Israel came to Kadesh, but then left to wandered somewhere else for 38 years, then returned in year forty: "In the first month all the people of Israel arrived at the Desert of Zin, and they stayed at Kadesh. There Miriam died and was buried." Many commentators mistakenly believe this was the 40th year, but they are wrong. The verse tells us they arrived at Kadesh in the first month, but does not tell us the year! It does not say, "the first month in the 40th year". Since Israel left Sinai in the second month of the second year after leaving Egypt (14 months), this means they arrived at Kadesh in the first month of the third year after leaving Egypt or 24 months. See Exodus route calendar for more details. b. It amazes me that people miss such simple information. When the book of numbers is full of detailed chronological information and a generic "first month" (Nisan) is referenced, we must read in reverse to find the LAST full dated reference, which in this case is Numbers 10:11 which explains Num 20:1.
d. So the simplest reading of Num 20:1 is that they left Kadesh on 20th Iyar in year two after leaving Egypt and arrived at Kadesh Barnea in Nisan year 3 after leaving Egypt. a. There just is not enough time to fit in all the events in Numbers 20 in four short months. 4. There are many insurmountable problems with the view that Num 20:1 is the 40th year and therefore must be firmly and confidently rejected. III. Numbers 14:25 "turn tomorrow and leave Kadesh"
1. As a clear message of failure of forward progress, God commanded them to turn around and head the way they came, down the Aaraba valley towards Elat from Kadesh (Petra). a. However the next day they began an invasion of Canaan which resulted in defeat. This would have taken days if not weeks to complete. b. Clearly the following day they DID NOT leave Kadesh and WOULD NOT leave Kadesh in spite of the commandment of God. c. If they did leave Kadesh, there is ABSOLUTELY no evidence they did. d. Although God commanded Israel to leave Kadesh, they disobeyed and would not leave, which may have caused God to change His mind and just leave them there for the next 38 years. There is no evidence they ever left! e. This is the simplest view and the one favoured by the author. 2. Another view, is that the Hebrew text for "tomorrow" is a generic expression meaning, some time in the future (in this case 38 years) you will turn and leave Kadesh. We acknowledge that the majority of the time, Strongs: 4278: machar indeed means simply tomorrow but not always. 3. When the second attempt to take Canaan was made in rebellion to God demanding they leave Kadesh, this would have been a great time for Moses to leave Kadesh towards the Red Sea at Ezion Geber in obedience to God but they stayed put at Kadesh. If there was any time or place that Moses left Kadesh Barnea in the third year, it would have been at exactly Number 14:44, which instead says THEY NEVER LEFT THE KADESH CAMP. Imagine the scene of the disobedient Hebrews crossing the Arabah Valley to attack the Canaanited in the promised land ALL THE WHILE Moses and the Ark of the Covenant AND Aaron AND the obedient Hebrews were marching away from Petra (Kadesh), southward towards the gulf of Aqaba. What a spectacular scene that would be. BUT IT NEVER HAPPENED! The verse cold be paraphrase this way: "If Israel wants to return to Egypt then "LET THOSE WHO WANT, TURN BACK TOMMORROW AND RETURN TO EGYPT THE EXACT WAY THEY CAME and die at the hands of the Amalekites and the Canaanites who live in the valleys. But while you are following your LEADER and are heading to Egypt being attacked by the Amalekites and the Canaanites in the Arabah Valley, Moses and Aaron will be staying put at Kadesh in safety." What is interesting about the Irony view, is that the very path Israel would take from Kadesh (at Petra) south to the gulf of Aqaba WAS ONE HUGE VALLEY BETWEEN TWO HUGE MOUNTAIN RANGES. Perhaps the statement that the "Amalekites and the Canaanites live in the valleys" was as way to spook them and strike terror into their hearts. On the other hand, if they had left, and it is almost certain that some of the 6 million camped at Kadesh did attempt a return, that these would most likely have been killed IN THE VALLEY OF THE ARABAH as they headed back to Egypt in the most direct route possible. Again, if the passage is irony, clearly Moses did not leave Kadesh. 2. What could be clearer? a. 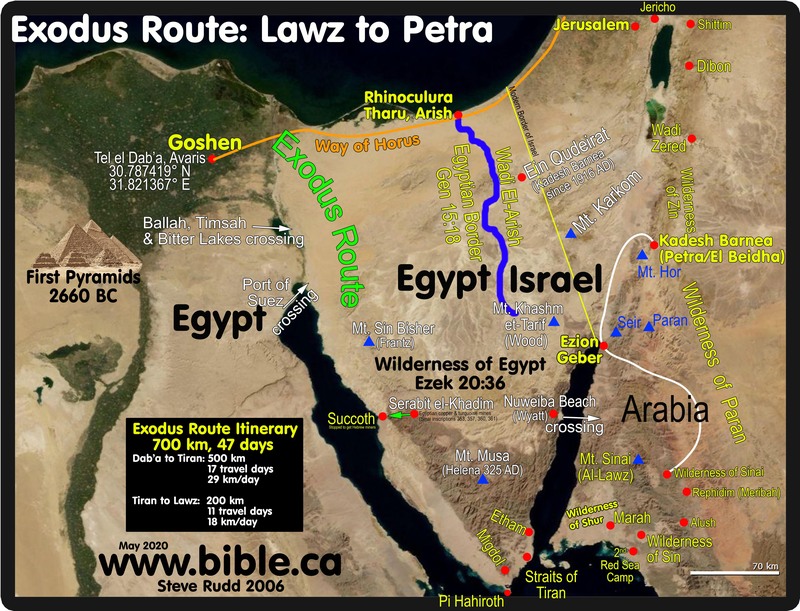 The entire discussion and context is the time it takes to get from Sinai to Kadesh: a normal 11 day journey via a standard caravan but since Israel was disobedient, this same trip took 38 years before they moved on. b. The bible specifically says "they spend MANY days at Kadesh" which contradicts those who claim they spend only a few days there and left for 38 years and returned again for a few days. c. The bible specifically says that from Kadesh to crossing the Zered was 38 years. Nowhere is there any indication they left Kadesh and returned. 1. The Bible is rather explicit that Israel spent 38 continuous years at Kadesh. a. The Bible says they spent 38 years at Kadesh even calling their time there "many days"
b. There is no indication they ever left Kadesh. d. There is no indication there was a second visit to Kadesh. 2. The events of Numbers 20:1 can be clearly dated to the Nisan (1st month) of the third year after leaving Goshen, not the 40th year. a. The events of Num 20:1-13 (Korah, Miriam, water from rock etc.) cannot be fit into 2-4 months. b. Those who were part of the events of Num 20 had recently left Egypt. 3. The material in Numbers is not in strict chronological order and the stories jump forward and backward, hence 20:1-13 happens before chapters 14-19 etc. The Material of Num 20:1-13 is elliptical. 4. The demand for water would be the very first thing Israel would make of God in a dry place like Kadesh on their first visit not their second visit. a. In fact there is evidence that Moses' striking the rock for water happened BEFORE the spies were sent out from Kadesh to Hebron. They would not send out a scout troupe until their basic needs like water were met. b. 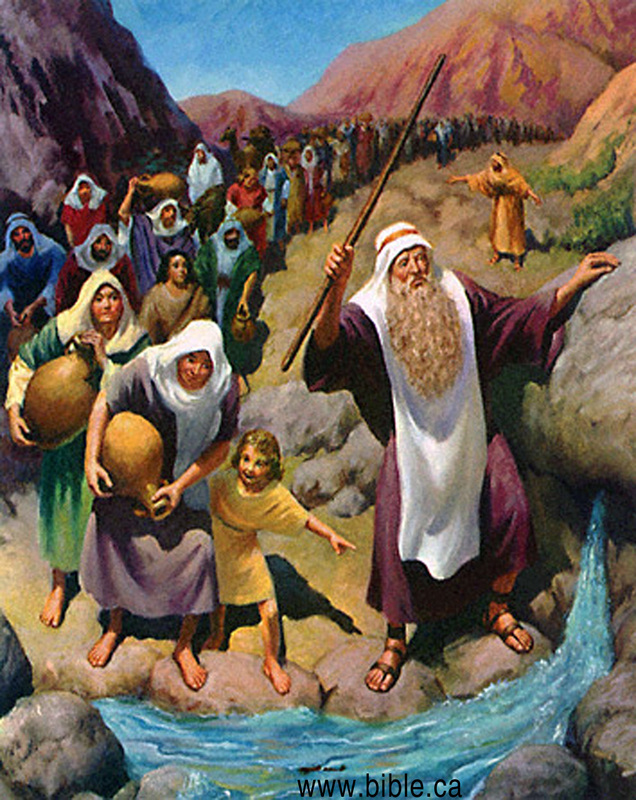 Notice when the spied returned that only Joshua and Caleb would cross the Jordan, indicating that Moses and Aaron had already been barred entry into the promised land because of striking rather than speaking to the rock. 5. The only Bible verse that suggests they left Kadesh is Numbers 14:25 where God commands them to leave Kadesh, but in fact Israel refused to leave and God may have changed his mind and allowed them to stay at Kadesh. a. After being told to leave Kadesh, there was a plague that killed the 10 bad spies and then they left Kadesh to invade Canaan without Moses who stayed in the camp at Kadesh with the ark. c. This would have been a great time to leave Kadesh towards the Red Sea at Ezion Geber in obedience to God but they stayed put at Kadesh. 6. Just because many people believe there are two Kadesh visits, does not mean they are correct. 7. Israel arrived at Kadesh Barnea in the first month of the third year and never left until 38 years had passed. Then they headed south down the Arabah valley past Ezion Geber a second time, then east, then north around Edom and Moab.